I was thinking about all of the things we received at our shower – our friends and family were so generous, it was pretty overwhelming. Some of the baby gifts we received were necessities – diapers, car seat, crib, etc. Some other things, we never used. Here is a video that shows it off a little bit: http://leachco.stores.yahoo.net/podster1.html. It’s basically a Boppy with a closed end, so the baby can lounge in the pillow. I put the cushion on the couch and Punkie hangs out with me while I’m doing things that require me to have my hands free (like take tons of photos of Punkie, fold laundry, eat lunch). You can’t carry the baby every minute of every 24 hours in a day, but I didn’t want to put him in a bassinet where I couldn’t see or talk to him. Having the cushion on the couch, I could sit next to him and talk to him constantly (lucky kid?). The cushion inclines the baby a little bit so he can see what’s going on around him (I hear that it’s good for reflux). It’s also very comfy and is Punkie’s favorite nap location. I use this thing EVERY. DAY. When Punkie outgrows this cushion, I will be very sad . The day is near – he is rolling now, so the cushion on the couch is no longer a totally safe hang-out for Punkie. 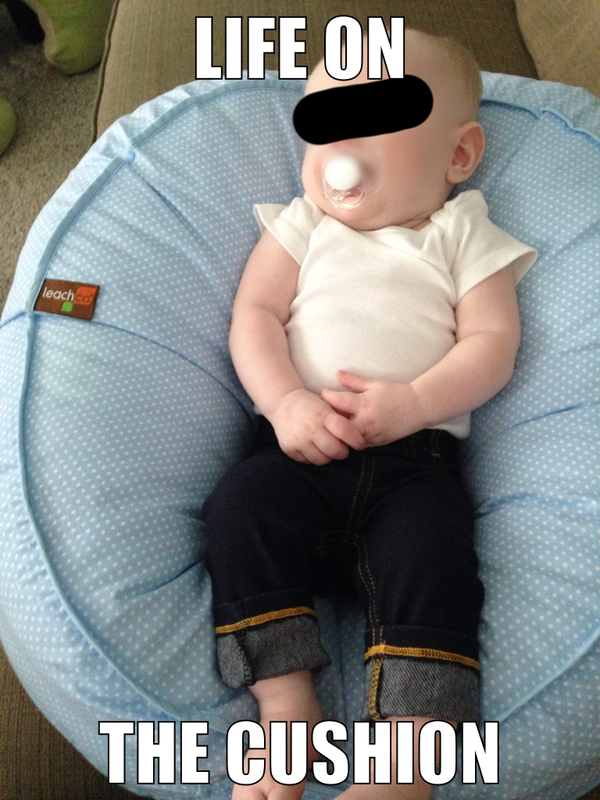 This entry was tagged baby nap, leach co, mommy blog, podster, product review, review podster. Bookmark the permalink.